The hive-minded tech press is always quick to heap praise on companies like Apple, Samsung and to a lesser extent HTC when they release new devices. They’re usually stingy with the accolades when it comes to Microsoft’s various mobile offerings. The Surface line in particular has never gotten the attention it deserves. The new Surface Pro 4 may just change a few minds with regards to business-focused hybrid tablets. 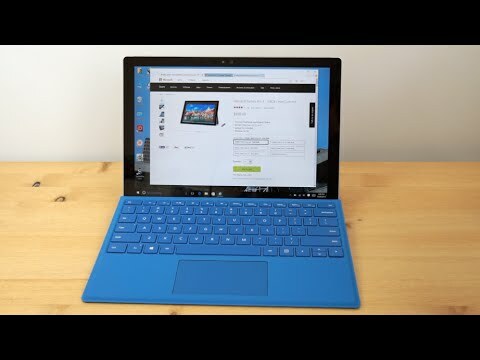 Besides a smaller bezel that allows for a larger display, the Surface Pro 4 looks much like the SP3. It’s a bit thinner and lighter at just 8.45mm thick and as little as 766 grams in weight. The included 12.3-inch PixelGlass LCD boasts a 2,736×1,824-pixel resolution with a 3:2 aspect ratio. Lastly, the integrated kickstand can adjust from 22 to 150 degrees. At present, there are five distinct Surface Pro 4 variants that offer an array of computing power and storage options. Available CPUs range from the Intel Core m3 to the beefy Core i7. Models can be configured with up to 16GB of RAM and 1TB of SSD storage. Every Surface Pro 4 boasts 5MP front and 8MP rear cameras, USB 3.0, a microSD slot and a Mini DisplayPort. The Surface Pro 4 runs an unmodified version of Windows 10 Pro, thereby delivering the same computing experience as any other official Windows 10 laptop. Buyers get the usual free apps like Skype, Microsoft Edge, OneNote and Cortana as well as a free 30-day trial of the full Office suite. Thanks to a custom TPM chip, this tablet hybrid delivers impeccable enterprise security. The SP4 has the usual 802.11ac Wi-Fi and Bluetooth 4.0 capabilities as its predecessors. Each model comes with the acclaimed Surface Pen, which features an eraser, magnetic storage and 1,024 levels of pressure sensitivity. The optional Surface Pro 4 Type Cover has been redesigned with new back-lit keys and 1.33mm of key travel. The Surface Dock comes with a slew of additional ports like USB 3.0 and Ethernet. The Surface Pro 4 is a beast when it comes to computing firepower. It’s 30% faster than the old SP3 and 50% quicker than a MacBook Air. The Core i5-6300U version posts a score of around 5,400 on PCMARK7 while the i7-6600U gets into 5,700 territory on the same benchmark test. In other words, it bests comparable laptops like the Dell XPS 13 rather handily. Battery life is a respectable 7 hours. The Surface Pro 4 is more powerful than a MacBook Air, versatile enough to double as a laptop and incredibly thin to boot. It also comes with the improved Windows 10 and has a slew of terrific accessories like the Type Cover. Its only major drawbacks are the somewhat lackluster battery life and the fact that there’s only one USB 3.0 port installed. Thanks to many gradual improvements that add up to a big difference, the Surface Pro 4 is the best-selling Microsoft tablet yet. Though a bit pricey, it’s a robust productivity machine no matter what you do for a living. If you need power and flexibility in your tablet and don’t mind paying for it, the Surface Pro 4 is an enticing possibility.